A lively and dynamic city cannot be conceived without flourishing and attractive businesses. As national and international Retailers are undoubtedly the traffic builders behind any commercial site, it is useful to understand their evolution in city centres. To establish a relevant diagnosis on this vital issue, it is essential to have reliable measurement tools : an “Observatory of businesses” is unavoidable. This is what Codata has been offering for 25 years. Our data collectors-managers survey the land throughout the year relying on identical data collection rules everywhere. This method, which is systematic and applied from year to year, makes it possible to compare data between commercial sites but also over time. 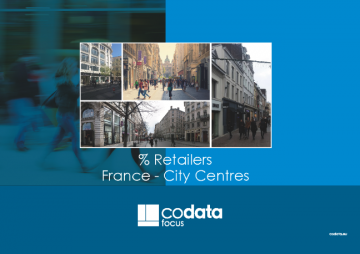 The three “Codata Focus” that have just been published for France, Belgium and the Netherlands indicate the evolution trend in the percentage of Retailers for all Commercial Sites of the “Shopping Street” type. For each of the three countries, a city was chosen to show in detail all the figures and documents available site by site on Codata Explorer. 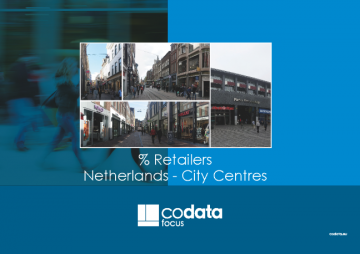 Of course, Codata Explorer allows you to edit the same documents for each of the 7,000 Commercial Sites listed periodically : city centres, shopping centres and retail areas. Our team is at your disposal for any information on this subject. 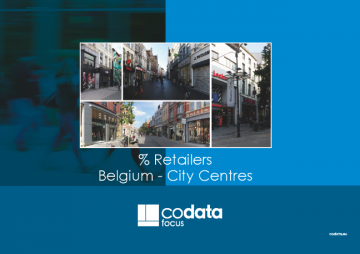 Download the “Codata Focus - % Retailers - City Centres - France - Belgium - Netherlands” for free.